Over 99% of our orders leave our warehouse within 1 business day. 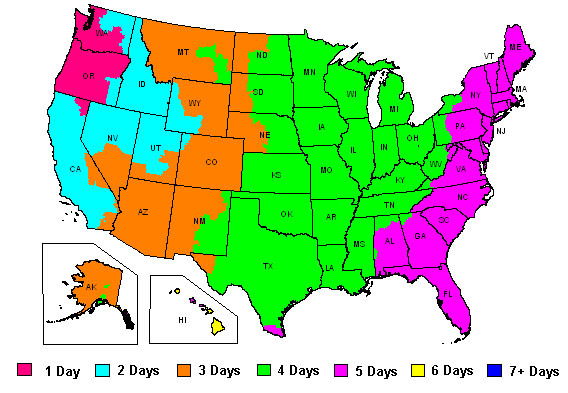 After an order leaves the warehouse, the map below shows the average transit ground time from Independence, OR. The day an order ships does not count as a business day. All orders shipped on Monday will arrive anywhere in the continental U.S. by Saturday. When you select the "add to cart" button to make a purchase, you will then be asked to type in your zip code and choose one of the shipping methods above. At this point in time, our system links directly to FedEx to calculate the exact shipping charges (or less) to your zip code before your proceed to "check out" based on the amount of weight or box size of the package. This way you will know exactly what shipping charges are before you finalize your purchase. USPS rates are based on our own matrix of calculations. For FedEx Ground, Next day air, 2nd day air and FedEx Express Saver, the day it ships does not count. Therefore, if you order an expedited package on Monday via FedEx Express Saver, your package will ship on Tuesday and arrive on Friday. If you order on Tuesday, your package will ship on Wednesday and will not arrive until the following Monday. Approximately 99% of orders ship the next business day after an order is placed. There is NO guarantee any expedited packaged will be delivered on Saturday.